Zhong Kui lived during the reign (712-756 AD) of Emperor Xuanzong of the Tang Dynasty. However, just at the moment he achieved the pinnacle of success which would guarantee him fame and fortune, he suffered such misfortune that he took his own life. Over the centuries, a mythical Zhong Kui evolved who, now immortal, protects others from evil and brings happiness and good fortune. Zhong Kui has also become one of Peking Opera’s most popular and beloved character roles. On April 20th, China released a second series of gold and silver coins commemorating famous characters of the Peking Opera. This set of coins, officially known as the Peking Opera Facial Makeup Series, includes a gold coin with a denomination of 100 yuan honoring Bao Zheng who was an official during the Northern Song Dynasty and a symbol of justice and integrity. Two silver coins denominated at 10 yuan were also released. One silver coin honors Dian Wei who was a military general under Cao Cao during the Han Dynasty. The other silver coin, shown at the left, honors Zhong Kui who is a character in the ever popular Peking Opera “Zhong Kui Marries Off His Sister”. Zhong Kui was a gifted scholar who succeeded in passing the highest examination of the imperial examination system making him eligible for an important office which would ensure a life of wealth and honor. However, Zhong Kui was denied these rewards because he happened to be physically disfigured and was considered too ugly. Zhong Kui was so despondent that he committed suicide by bashing his head against a pillar. In China, history and myth frequently merge and this was the case with Zhong Kui. The immortal Jade Emperor took pity on him and appointed him to be the protector of mortals and to be both judge and executioner in the fight against demons and evil spirits. Pictures of Zhong Kui, in his mythical role as the “Demon Slayer” or “Demon Chaser”, have traditionally been hung on the walls of Chinese houses as a form of protection. 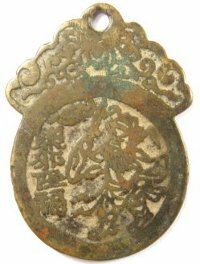 For the same reason, Zhong Kui is also seen on old Chinese charms and amulets such as the one at the left. A robust and heavily-bearded Zhong Kui is seen here wielding his famous “Demon Slaying” sword. The projections extending from each side of his hat are actually “demon-seeking” devices which point at unseen and lurking dangers. Also, just above and to the left of his head is a bat. The bat is often seen together with Zhong Kui as a symbol of “good fortune” and “happiness”. This is because the Chinese language facilitates the creation of puns and rebuses. In Chinese, the word for “bat” (fu) and the word for “happiness” (fu) have the same pronunciation. Also, if you observe closely, you will notice that the bat is actually flying upside-down. The Chinese word for “upside-down” (dao) and the expression “have arrived” (dao) have the same pronunciation. Therefore, to say “the bat is upside-down” sounds exactly like saying “happiness has arrived”! Some of the same characteristics that identify this “mythical” Zhong Kui can also be found in his Peking Opera character. 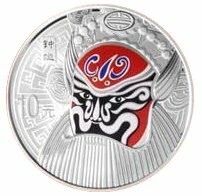 For example, the makeup of Zhong Kui on the Peking Opera coin includes a heavy beard. Moreover, the beard helps set off the face which, along with the ears that look like wings, gives the face the appearance of a bat. As already mentioned, the “bat” symbolizes the “happiness” he can bring to mortals. To further emphasize the “bat” and “happiness” rebus, an image of a bat flying downwards is actually painted on the forehead. As part of the makeup, Zhong Kui is given red cheeks to symbolize dignity. The painted black and white lines on the face express uprightness and the mouth is shown smiling to express Zhong Kui’s amiability. The top of the head is painted red as a reminder that he died by beating his head against a pillar. However, at the very top of his head is an oval-shaped design which in reality is a very stylized version of the Chinese character shou meaning “longevity”. In spite of his suicide, Zhong Kui became immortal. The Zhong Kui of the Tang Dynasty was denied the honor, wealth and happiness he had earned and he died in sorrow by his own hand. But the mythical Zhong Kui has become immortalized as a popular character in traditional Peking Opera. And, for many centuries, images of Zhong Kui have been hung in countless Chinese homes and carried as charms and amulets to provide protection from evil spirits and to bring “happiness” and “good fortune”.